TRIFECTA: Meet the GM LE2 Engine. The LE2 is part of a family of new generation engines from GM called the Small Gasoline Engine (SGE) family. In the United States, the LE2 powers the 2016+ "gen II" Chevrolet Cruze, and the 2016+ Buick Encore Sport Touring Edition (with expansion into other vehicles types in model year 2017). SGE family engines range in displacement from 1.0L (three cylinder) to 1.5L. All use a common bore size of 74mm, and there are three stroke configurations available - 77.4mm, 81.3mm, and 86.6mm (and as such, all engines are considered "undersquare" where the stroke is longer than the bore size). RPO: LV7 - 1.4L naturally aspirated, multi point fuel injected (MPFI). Used in the 2016+ Chevrolet Spark, making 98HP and 94 lb-ft torque. Bore/stroke is 74mm/81.3mm. RPO: LE2 - 1.4L turbocharged, spark ignited direct injected (SIDI). Used in the 2016+ "gen II" Chevrolet Cruze, and the 2016+ Buick Encore Sport Touring Edition, making 153HP and 177 lb-ft torque. Bore/stroke is 74mm/81.3mm. RPO: L3A - 1.5L naturally aspirated, spark ignited direct injected (SIDI). Used in the 2017+ "gen II" Chevrolet Volt, making 100HP and 103 lb-ft torque. Bore/stroke is 74mm/86.6mm. RPO: LFV - 1.5L turbocharged, spark ignited direct injected (SIDI). Used in the 2016+ Chevrolet Malibu, making 163HP and 184 lb-ft torque. Bore/stroke is 74mm/86.6mm. The SGE family is slated to replace three different, older GM engine families, S-TEC, Family 0, and Family 1. When just looking at the numbers, it might be simple to conclude the LE2 is simply a direct-injected variant of the LUJ/LUV, but that's not really the case at all. The LE2 is a clean-sheet redesign, and, while it shares some characteristics with the LUJ/LUV, there's actually more different about it, than similar. In fact, even the bore and stroke are different! 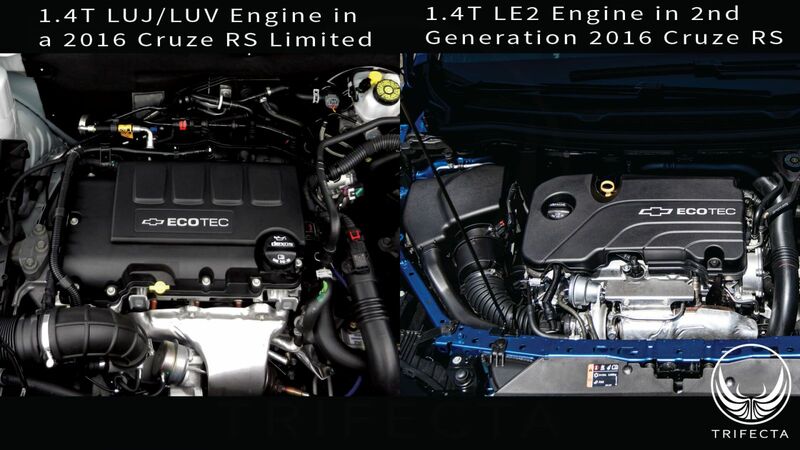 While both are technically called "1.4L" displacement engines, in reality the LE2 is slightly larger than the LUJ/LUV. The LE2 displaces 1399cc, and the LUJ/LUV displaces 1364cc. The LE2 uses a 74mm bore with an 81.3mm stroke, and the LUJ/LUV uses a 72.5mm bore with an 82.6mm stroke (making the LE2 closer to "square" than the LUJ/LUV). Moving on to the engine block, the LE2 uses an all-aluminum engine block whereas the LUJ/LUV uses a cast iron engine block. The LE2 uses a forged steel crankshaft whereas the LUJ/LUV is not forged. The piston wrist pins are fully floating in the LE2, in contrast, the wrist pin is pressed into the connecting rod with the LUJ/LUV. Both use an aluminum cylinder head, with four valves per cylinder, actuated by camshafts located in the cylinder head (DOHC). 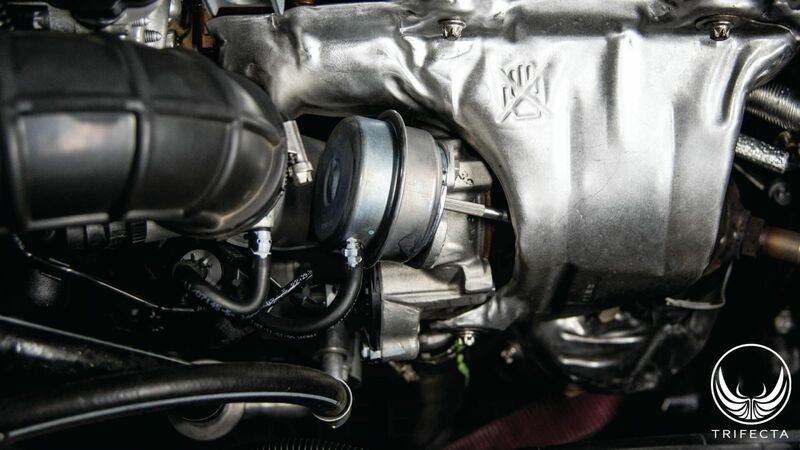 Both engines utilize independent variable valve timing (VVT) on both the intake and exhaust camshafts. 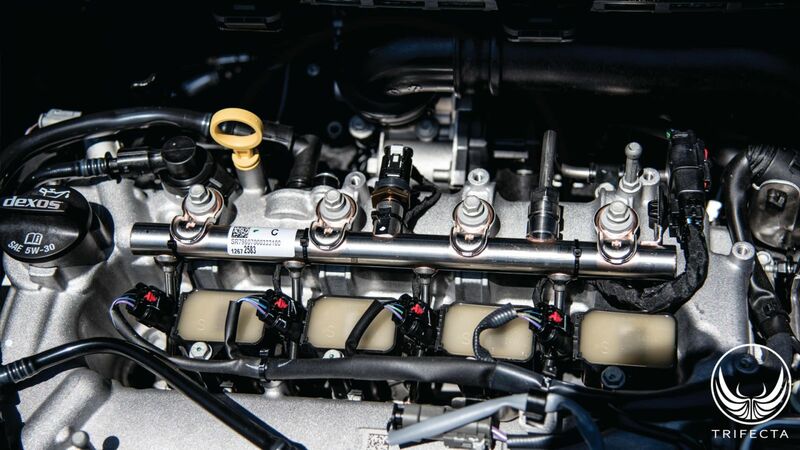 Covering the camshafts on the LE2 is an aluminum valve cover which provides superior valve train noise suppression, whereas the LUJ/LUV uses a composite valve cover with integrated PCV assembly (which is prone to failure on earlier LUJ/LUV engines). 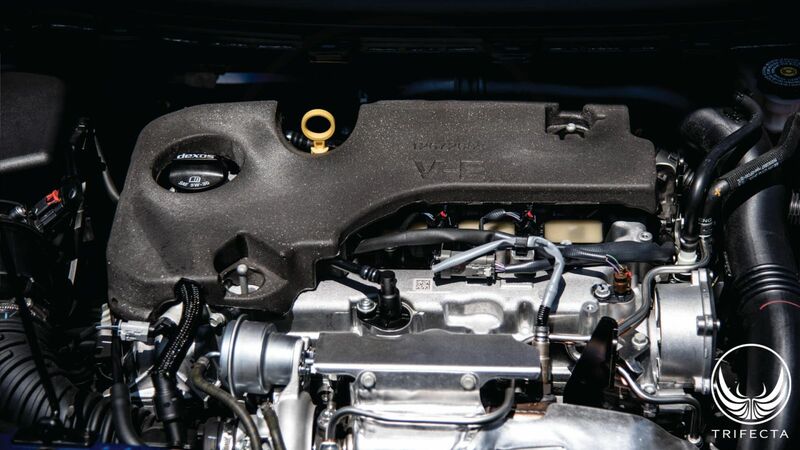 Noise suppression was an important goal of the SGE design, and one drive of the 2016+ "gen II" Chevrolet Cruze showcases the work GM did in this area. 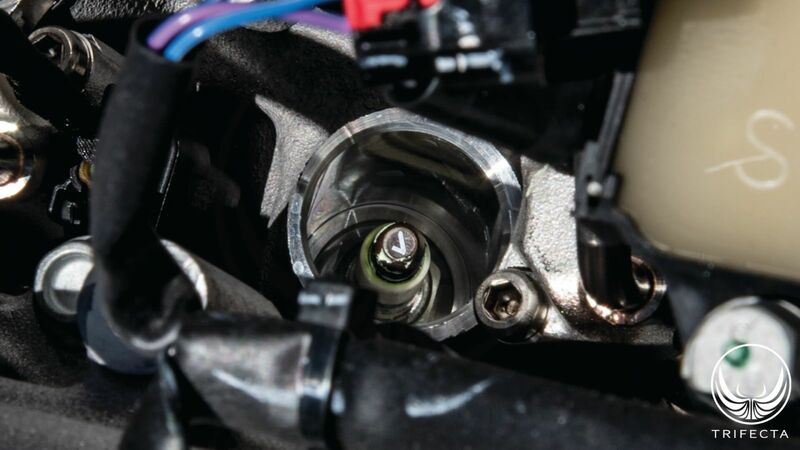 The direct-injectors, which are normally quite loud are isolated from the valve cover using bushings, and underneath the engine cover is a large piece of noise-suppressing foam. One feature that's trickled down from the modern GM V6 (high feature V6) family into the SGE family is the integrated exhaust manifold. Put another way, there is NO separate exhaust manifold on the LE2, just one exhaust "port" in the cylinder head. This allows extremely close coupling of either a turbocharger, or a catalytic converter to the cylinder head for optimum performance and lower emissions. Because of the lighter materials and integrated engine design, the LE2 weighs in at a whopping 44 pounds less than the LUJ/LUV. On the fueling side, the LE2 uses spark ignited direct injection (SIDI) and the LUJ/LUV uses multi point fuel injection (MPFI). As such, the LE2 uses a much different piston design (featuring a toroidal / ovoidal shaped combustion cavity in the piston head for optimized SIDI operation). Because the LE2 uses SIDI, it borrows technology traditionally found in diesel engines. 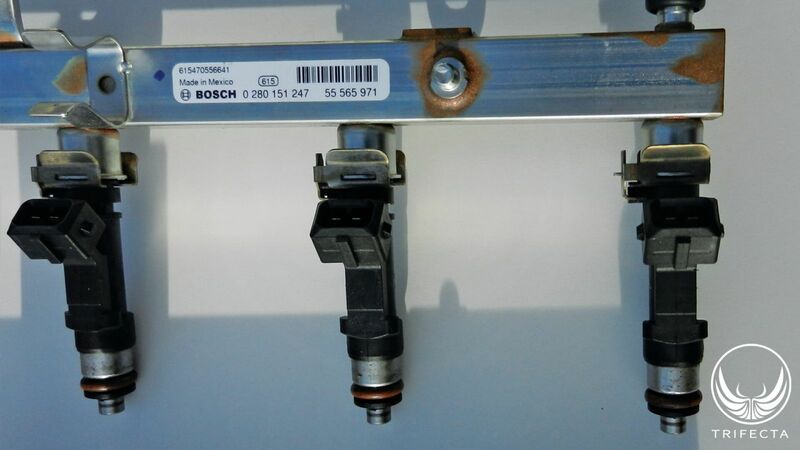 The LE2 features a common rail for the injectors, and a mechanically driven (by the intake camshaft) high pressure fuel pump complete with a high pressure rail pressure sensor. On the LE2, each cylinder's injector is located in the cylinder head, adjacent to the spark plug, in the valley between the two camshafts. 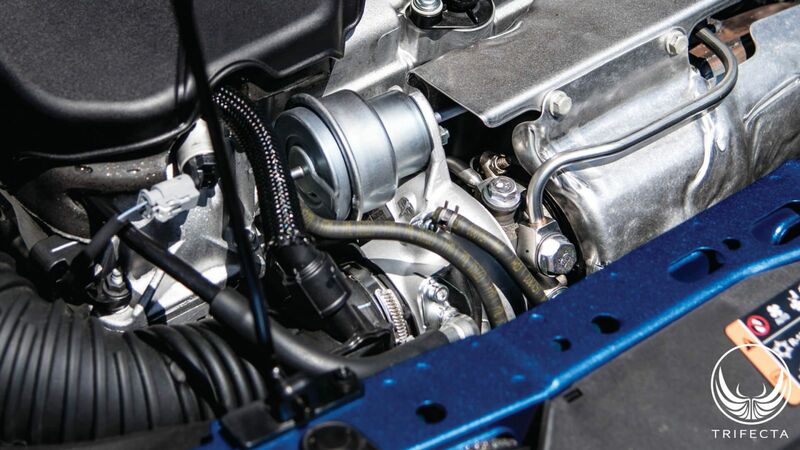 On the LUJ/LUV, being the engine is MPFI, each fuel injector is located in the intake manifold, just before the intake valve, serviced by a ECU-controlled, variable (low) pressure fuel pump (the LE2 also features an ECU-controlled variable low pressure fuel pump to feed the mechanical high pressure pump). We also find some differences in the ignition system. 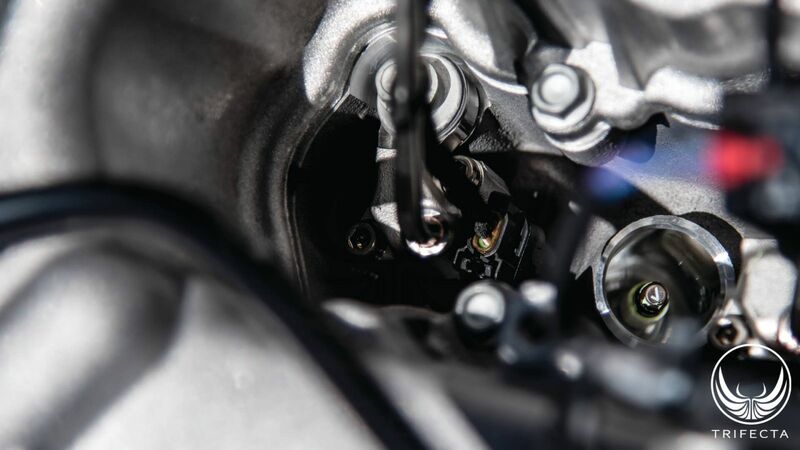 The LE2 features a per-cylinder, independent "coil on plug" ignition system, with the spark plugs located at an angle in the cylinder head, again an optimization for the SIDI fuel system. In contrast, the LUJ/LUV features a single "coil pack" which houses all four ignition coils (also a common failure point on this engine). The LUJ/LUV spark plugs are not angled. On the exhaust side of the engines, things could not be more different. While both have a "forward facing" exhaust port configuration (and, hence the turbocharger is located towards the front of the vehicle in both engines), as mentioned previously, the LE2 sports an integrated cylinder head / exhaust manifold design with a single exhaust "port" which the turbocharger assembly is directly bolted to. The LUJ/LUV features a traditional exhaust port configuration in the cylinder head, but the exhaust manifold and turbocharger turbine assembly are cast as one piece, in iron. Both use a spring-loaded-closed wastegate design (controlled by an ECM-driven boost control solenoid) with the turbocharger to control the turbine/compressor speed, but the LE2 uses a fully electronic bypass valve (like the LTG, LF3 and LF4 turbo engines) whereas the LUJ/LUV uses a more traditional mechanical bypass valve (controlled by the ECM via a solenoid). Studying the compressor maps for the LE2 turbo, we find a turbocharger that can move more air, more efficiently, at a lower compressor RPM (the LE2 turbocharger only needs to spin at ~200000 RPM to do what the LUJ/LUV does at ~270000 RPM). 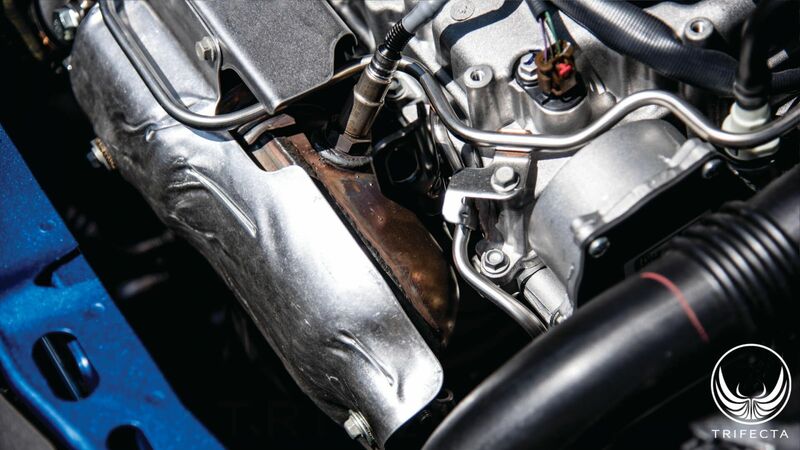 Catalytic converters like it hot, and with the LE2, the catalytic converter is located even closer to the turbocharger outlet for superior emissions control. The LUJ/LUV catalytic converter is located further downstream due to packaging constraints. To drive the new LE2 engine, an upgraded engine control module (ECM) is required. The new generation "E80" SIDI ECM has seen service in vehicles starting in 2015, and in the Cruze, is replacing the "E78" MPFI ECM used to drive the LUJ/LUV. One feature that the LUJ/LUV has, which the LE2 does not, is an ECM-controlled variable thermostat. 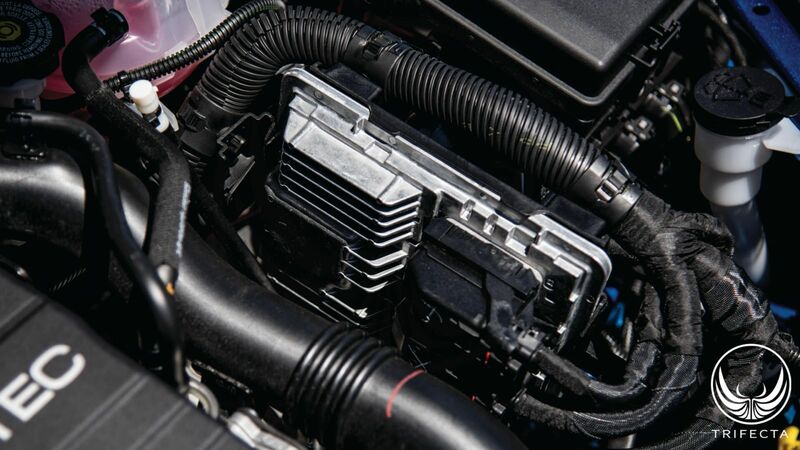 In the LUJ/LUV engine, the ECM dictates the desired engine coolant temperature and can control it by applying current to an electronic thermostat to either cause it to open at a lower, or higher temperature, depending on driver demand, cooling system demand, and other criteria. Because of the efficiency of the new LE2, the new 2016+ Chevrolet Cruze does not offer an ECO-specific variant, only the choice of manual or automatic transmission (as well as several trim levels: L, LS, LT, and Premier). According to GM, the manual transmission reaches up to 42MPG on the highway and the automatic transmission reaches up to 40MPG on the highway. With the LUJ/LUV, according to GM, fuel economy is up to 42MPG with the ECO manual transmission and up to 38MPG on the highway with the ECO automatic. Also, the new 2016+ Chevrolet Cruze features start/stop technology. When the vehicle is stopped, provided other criteria are met, the engine shuts off to avoid wasting fuel while sitting at a stop light. When the driver takes their foot off the brake, the engine starts again, seamlessly. The LE2 is factory-rated at 153HP (5600 RPM) and 177lb-ft torque (2000-4000 RPM). The LUJ/LUV is factory-rated at 139HP (4900-6000 RPM) and 149 lb-ft of torque (1850-4900 RPM). TRIFECTA's testing suggests that calibration changes will yield similar gains in the LE2 vs the LUJ/LUV. An exciting new era is upon us! 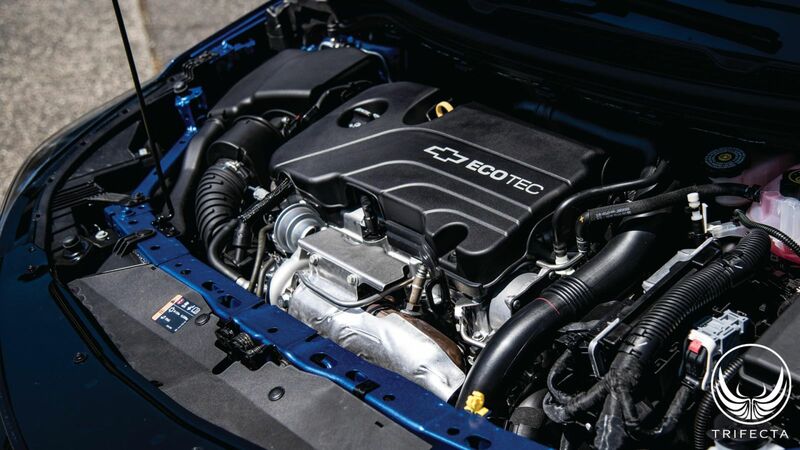 GM says the SGE family will replace all of the existing small gasoline-powered engines in their lineup by the end of the decade, so look to find the LE2 (or some variant of it) in all LUJ/LUV applications over the next few years, as well as more wide-spread use of the LFV (1.5L SIDI turbocharged SGE). TRIFECTA is more than excited to lead the aftermarket of the SGE family into the future! Very well written and informative article. Thanks for the research trifecta.